Gutters perform a very important role when it comes to protecting your home against the elements. However, to keep them functioning optimally, you’ll need to incorporate them into your annual home maintenance routine. Particularly before the fall and before any bad weather has been forecast, you should inspect your gutters to ensure that they’re well-prepared. Particularly if you don’t have a leaf guard installed in your gutter system, you should get into the habit of thoroughly inspecting it at least once per year, preferably during fall. Additionally, you should inspect it for any damage after storms. If you’re comfortable getting up on a ladder, check the gutters for any excessive buildup of detritus, such as rotting leaves. If you have a traditional sectional gutter system, remember that the seams between each section are weak spots in the structure that are relatively prone to cracking and forming leaks. If you suspect that the gutters might be damaged, especially after strong wind, be sure to test them thoroughly by using a hose to check for any leaks or blockages. You can usually get rid of light blockages simply by using a high-pressure hose. However, you’ll want to make sure that the gutters are properly secured so that they don’t come loose. Alternatively, you can use the safer method, which involves using a specialized gutter cleaner. These cylindrical brushes work rather like pipe cleaners in that they can turn around corners to get rid of more stubborn blockages. 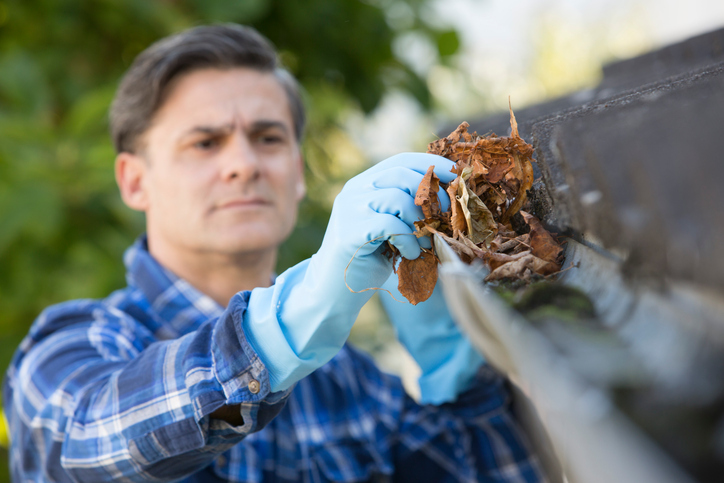 Removing leaves and other detritus from the gutters themselves is also important, especially during the early autumn. An excess buildup of such detritus can lead to increased amounts of standard water, which in turn can encourage mosquitos and other pests to make their homes in your gutters. Rotting organic matter can also eventually cause damage to nearby structures, such as fascia boards. It’s usually easy enough to repair leaking or sagging gutters, but if they are showing a great deal of wear and tear, then it might be time to replace them, preferably with a more efficient seamless gutter system. Otherwise, you can seal leaking joints and small holes using a vinyl sealant, depending on the material from which the gutters are made. Sagging gutters are usually a result of not having enough evenly spaced brackets to hold them up. By adding one or more extra hangers for extra support or replacing any failing ones, you can easily overcome the problem. Alternatively, if your gutters are due for an upgrade, Allied Siding & Windows provides maximum-strength, custom-made solutions for your home.